Bring your cookie swap into the digital age! Allow your guests to RSVP quickly and avoid duplicate recipes by using an online invitation platform! Before the swap, guests can share what they are bringing, and after the event, they can share recipes and memories from the party. Take time to enjoy your party by prepping cookies before the big day. Ziploc®brand Freezer Bags with Easy Open Tabs are perfect for storing pre-made dough! On the day of the party, simply take the cookie dough out of the freezer and pop it in the oven. While cookies are the focus of this party, consider providing a few things to complement them! Coffee and milk pair perfectly with baked goods, and savory appetizers will balance out all the sweets. Send your guests off in style with Ziploc® brand Holiday Containers. These containers, in festive holiday colors, are the perfect way to ensure cookies stay fresh and accessible after the party ends. 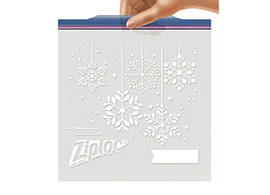 Ziploc® brand has a number of holiday products including Ziploc® brand storage bags with Easy Open Tabs that feature wintry snowflake and ornament designs, as well as Ziploc® brand limited edition containers in festive holiday colors. Brighten up your cookie swaps with products from Ziploc.